Gastritis is a condition characterized by inflammation of the stomach lining. It is most commonly caused by infection, but may also be the result of irritation, autoimmune disorders, reflux, pernicious anemia, long-term use of certain medications, alcohol use, cigarette smoking, caffeine, chronic vomiting, excessive stomach acid and trauma. Gastritis may be uncomfortable, painful and even debilitating. 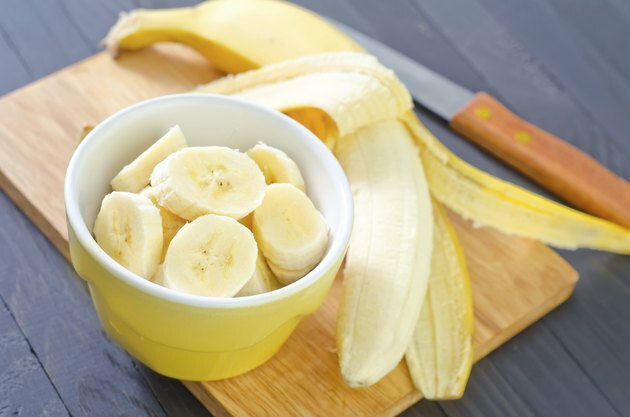 Eating bland foods such as bananas, which are gentle on the stomach, can help alleviate pain and ease symptoms. If you suffer from gastritis, you may experience a variety of symptoms or no symptoms at all. Additionally, gastritis can occur suddenly, meaning it is acute, or gradually, indicating chronic gastritis. Gastritis symptoms include indigestion, heartburn, abdominal pain, hiccups, loss of appetite, nausea, vomiting and dark stools. Cigarette smoking, alcoholism, old age, long-term use of nonsteroidal anti-inflammatory drugs, reflux, H. pylori infection or an autoimmune disorder will put you at a greater risk of developing gastritis. While treatment for gastritis is dependent on the underlying cause, making dietary changes can help relieve your symptoms. A bland diet consists of soft, easily digested foods. You should avoid high-fat, spicy or fried foods, alcohol and caffeine. It is important to eat foods rich in vitamins, minerals and flavonoids such as fruit to replace any losses you experience. A bland diet typically starts out with a few foods including bananas, rice, applesauce and toast. As your symptoms resolve, you can gradually add other foods back into your diet. Try eating small, more frequent meals rather than three large meals each day. Bananas are a good source of many vitamins and minerals, including vitamin B and C, potassium and dietary fiber. Just one medium banana has about 100 calories and 422 mg of potassium. Bananas are therefore an excellent high-calorie, nutrient-dense food choice when you are not feeling well. Additionally, bananas have no sodium, fat, saturated fat or cholesterol. The high-potassium content of bananas works as an effective antacid, neutralizing your body's pH. It also works to restore electrolyte and pH imbalances caused by nausea or vomiting. The fiber in bananas is binding. It adds bulk to stools and helps it move along more smoothly, especially when you are suffering from diarrhea. Bananas are recommended for those with gastrointestinal distress, because they are soft, easily digested and rich in potassium. Bananas are part of a bland diet and should be eaten before other solid foods when you have gastritis. When ingested, bananas provide protection from stomach acid by coating the stomach with thick mucus. Bananas not only restore gastric pH, but also help eliminate harmful bacteria and restore the bacterial balance of the stomach. Solid foods such as bananas are not recommended immediately after vomiting. You need to follow a clear liquid diet. However, bananas should be one of the first solid foods you choose.